I've been a bit crap over the past six months or so. I've missed birthdays (and not just any old birthdays, I've missed some big milestone birthdays too). I've neglected to send cards for the birth of babies. I haven't called to congratulate you on your wedding anniversaries. I've not responded to texts. I haven't called you back. I've not replied to your Facebook messages or WhatsApp posts. 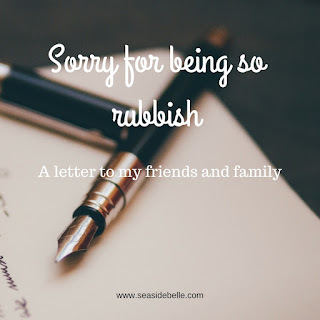 I have been a completely rubbish friend. It's not because I don't think of you. It's not because I don't care. It's just, I've been a bit tired and overwhelmed over the past year or so. The months and months of sleep deprivation have stolen who I am and left an exhausted shell. My self-confidence and self-belief have taken a bit of a battering. It's taken every ounce of energy I have to just manage the basics of preparing dinner each night, of making sure the children are wearing clean clothes and that they are dropped off and picked up from school on time. Everything else has fallen by the wayside. But now that the summer is here, and the days are longer and brighter, I think I can feel my mood lifting. My diary is a place of hope, with plans of socialising and getting back out in the real world rather than a source of dread of all the cards I haven't sent and things I have failed to do. The sleep is still terrible, but I feel stronger and more able to deal with the fatigue. One day he will sleep through and I'll be back to the person you remember, full of life and energy. So please forgive me for neglecting you all. I feel terrible. Give me a chance to get back in touch without it being awkward - it might be a while, my list of people I've failed to touch base with is extremely long. And please be patient and bear with me as I try and get back on to the rollercoaster of life. I'm sure I'll continue to have up days and down days. But I'm optimistic that the good days will soon outnumber the days where I'm down. Life will no doubt continue to throw up challenges, but if I know you're still by my side, that you've still got my back, I'll be strong enough to deal with it all. Thanks. It's definitely one way of sorting the wheat from the chaff! I definitely know what you mean about falling off the map. It can be hard to admit that you're not superwoman, but actually, if you explain what's going on, people are more likely to be understanding. Obvs - I was too scared to do it in person, so I've done it on the blog instead. Thanks. They always say true friends can go for years without being in touch and then when you get together, it's just like no time has passed at all. And hopefully, I can do the same if they ever need it too. Oi. You're still superwoman to me. I missed this post when you first wrote it (as I have also been a bit rubbish this last year or so!) I think you're awesome. I know I'm not nearby so can't do so very much to help, but if there is anything, please do just shout and I'll do what I can. Love you Jo. I've only just worked out how to get here! I know it's been a tough eighteen months, but I didn't realise how much you were beating yourself up about it. I think the summer has proved just how precious you are to your friends and to your family. Keep your pecker up and hold your head high. You're worth it!